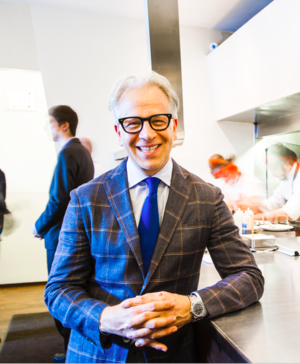 Among the city’s most acclaimed restaurateurs, Chicago-born Donnie J. Madia has mastered the art of collaboration to execute his unerring instincts for style, atmosphere and hospitality. His unique blend of visionary inspiration, attention to detail and sense of unlimited possibilities informs all he touches, as evidenced in Blackbird, avec, The Publican, The Violet Hour, Big Star, Publican Quality Meats, Dove’s Luncheonette, Publican Quality Bread, Café Cancale, Publican Tavern O’Hare and Pacific Standard Time. His gift for connecting talented individuals and business acumen was recognized by the James Beard Foundation in 2015, when he was awarded Outstanding Restaurateur. A consummate family man, Madia carries on the tradition of warmth and hospitality learned from his mother, Clara, and her twin sister, Rita. For his first project, Blackbird, Madia forged a partnership with chef Paul Kahan that would ultimately lead to some of Chicago’s most groundbreaking and memorable dining establishments. Another keystroke was the appointment of architect and interior designer Thomas Schlesser, with whom Madia has formed a long-lasting creative partnership and diverse collection of award-winning spaces. At Blackbird, Madia set out to challenge the old-guard formality of fine dining, while crafting a world-class restaurant experience. Madia’s vision effectively impacted the international culinary and design communities, earning him a James Beard nomination for Outstanding Restaurants Graphics in 2001. Madia and Kahan again partnered on avec, successfully pioneering communal dining and small plate dining, all while offering unparalleled ambiance and service. Madia’s creative team, Schlesser and graphic designer Jason Pickleman, drew international acclaim for their work – earning the James Beard Award for Outstanding Restaurant Design. Breaking into yet another category, Madia partnered with restaurateurs Terry Alexander and Peter Garfield, as well as mixology masters Jason Cott and Toby Maloney, to redefine the bar experience. From its onset, The Violet Hour received widespread attention and a cavalcade of international press, culminating in a James Beard Foundation award for Outstanding Bar Program in 2015. Madia’s next foray into hospitality was on a far grander scale with The Publican, a modern interpretation of a late-1800s beer hall with nods to Belgian pubs and French brasseries. The restaurant’s distinctive character led The New York Times’ Frank Bruni to honor the “outstanding newcomer” with a glowing review, and a James Beard nomination for Madia for Outstanding Restaurant Graphics in 2009. Big Star, the approachable honky-tonk whiskey bar and taqueria reminiscent of the ‘30s and ‘40s Bakersfield scene, was the next restaurant to receive Madia’s finesse and business acumen. From its opening in 2009, Big Star amassed a strong legion of admires drawn to the raucous, music-filled bar and its handcrafted tacos. Neighboring Dove’s Luncheonette, the group’s laid-back ode to Southern-inspired Mexican food, opened a few years later. One Off Hospitality formed in 2011 as a natural progression to the existing family of restaurants and carries the same spirit of hospitality imbued from Madia’s mother. As the term “one off” implies, each project is unique and may be the group’s last, which is why each project is handled with the utmost attention to detail and character. Madia’s commitment to hospitality earned him James Beard nominations for Outstanding Restaurateur in 2012, 2013 and 2014. An artisanal butcher shop at its core, Publican Quality Meats, which opened in 2012, is a neighborhood café, bakery and retail space by day, and a private dining room for The Publican by night. In 2016, One Off Hospitality successfully took on the challenges of creating its beloved Publican Tavern in Terminal 3 of O’Hare International Airport. A few months later, the group opened Anker, which follows their ethos of hyper-seasonality and sustainably sourced, farmhouse fare. At his core, Madia is a family man, dividing his time between his One Off family, his wife Estelle and their son Bronson. Madia also had been actively involved with pediatric cancer research non-profit Alex’s Lemonade Stand Foundation, both on a national level and locally in Chicago.